Beef Brisket Burnt Ends are one of the ultimate treats in BBQ and a true reward for your hours of hard work in low and slow cooking. 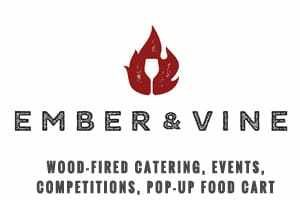 We are teaming up with Mishima Reserve to bring you an amazing cut of American Wagyu brisket and our favorite meat candy, beef burnt ends! Read to the end for an additional discount during their spring sale for the next 30 days! This post is sponsored by Mishima Reserve. All views expressed are our own, and reflect one heck of a good brisket. Wagyu (wag-you) refers to a Japanese style of beef, which uses very specific breeds of cattle native to Japan. As time went on, a few non-native breeds were cross-bred, but the Wagyu from Japan is highly regulated and is rare to find outside of Japan. American Wagyu is the same concept, leveraging specific breeds of cattle from Japan, and often cross-breeding them with American counterparts. Mishima Reserve sources full-blood Kuroge Washu bulls bred with their American cattle counterparts, giving an amazing marbling and an intense and gorgeous beef flavor. They are very different. For the USDA rating system (Select, Choice, Prime), ranchers opt into that program for a rating based upon a number of factors and with many different breeds of cattle from around the world. It is not required to have a rating, it’s a rancher’s choice. For American Wagyu, the rating system is based on the Japanese style of rating from 3 – 12 and has to be focused on the Japanese lineage of cattle. You will often see A-5, or something similar which refers to the marbling scale of 3 – 12. In addition to the Japanese rating, Mishima has their own strict rating scale — 4-Star, 5-Star, and Ultra. Just look at the cuts of meat and you can see the marbling variation with 4-Star, mirroring what you would get with with a quality steak based on the USDA system and the marbling going up from there. And I cannot stress enough the importance of marbling for brisket. It can make the difference between a tender juicy brisket and a dry firm brisket. For more information on how to prepare and start a full brisket, see this detailed post. Burnt ends are said to have originated in Kansas City by a few early BBQ pioneers. Today you can swing by Jack Stack or Joe’s Kansas City (formerly Oklahoma Joe’s) and taste their version of the KC origin story. We are using the entire Mishima packer brisket, smoking it until wrapped, and then separating the point from the flat to make burnt ends. 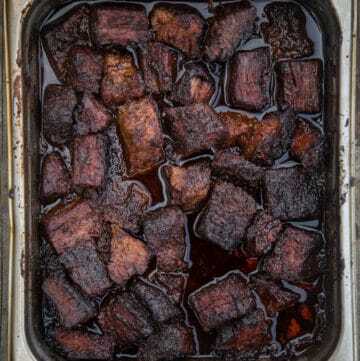 Have no fear, the flat will continue to be cooked, but these squared burnt end morsels of point meat are incredibly tender, and when sauced with a little (ok a lot…) butter and honey, they become lick smacking appetizers and are great for a crowd. Serve the brisket flat along side of the burnt ends or as the main dish. Don’t let the name fool you. 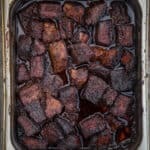 Burnt ends are not, in fact, burnt. 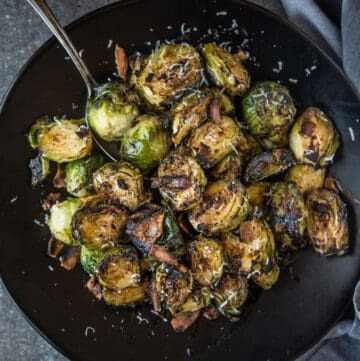 They are cubed up and have that darker color from the smoke creating bark, and then continue to form that color as they cook in the sauce as sugar in the sauce caramelizes. Help that along by adding honey, butter, agave nectar, or any other similar ingredient. Start by cooking the brisket packer as you would normally, this post highlights the details. 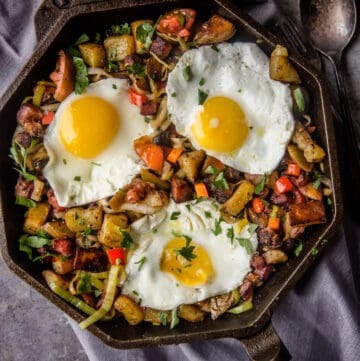 Ideal cooking temperature is low, 250 degrees Fahrenheit. We use fruit woods readily available in the Pacific Northwest, use your favorite local wood. 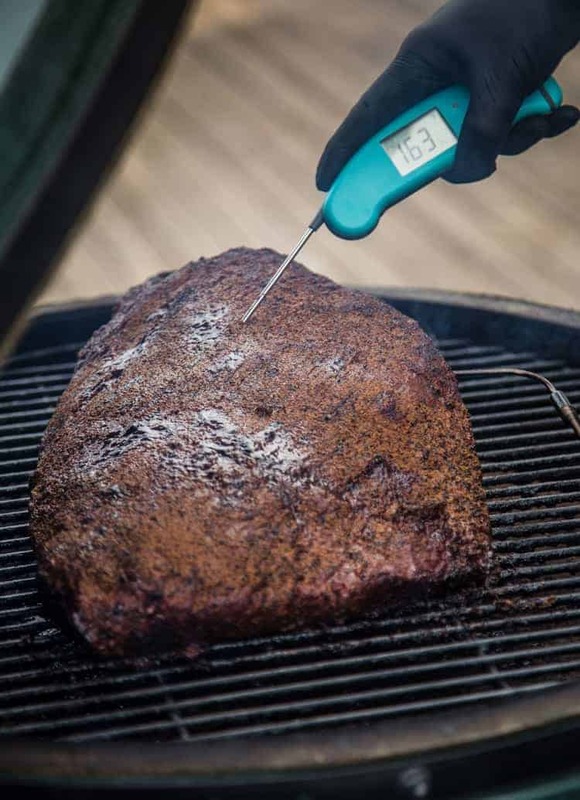 Typically this runs up to five or six hours until an internal temperature of 165 degrees, measured by an instant read thermometer like the Thermoworks Smoke unit or a Thermapen. At the time you would normally wrap your whole brisket (when internal temp reaches 165 degrees F), that is when we separate the flat from the point. Trim off some of the fat layer between the point and the flat, and then cut up the point into 1 1/2-inch cubes. Continue cooking the point cubes and flat separately. The point cubes go into a pan with BBQ sauce, butter, dry rub, and honey, and the flat is then wrapped and then placed back onto the smoker to continue cooking. You can also separate the point before you cook, but for our preferred method we cook the packer and then separate the point from the flat when we wrap. When placing the burnt ends into the pan, dust with more rub, then add sauce. It’s important to have enough BBQ sauce for the size of the pan you are using. 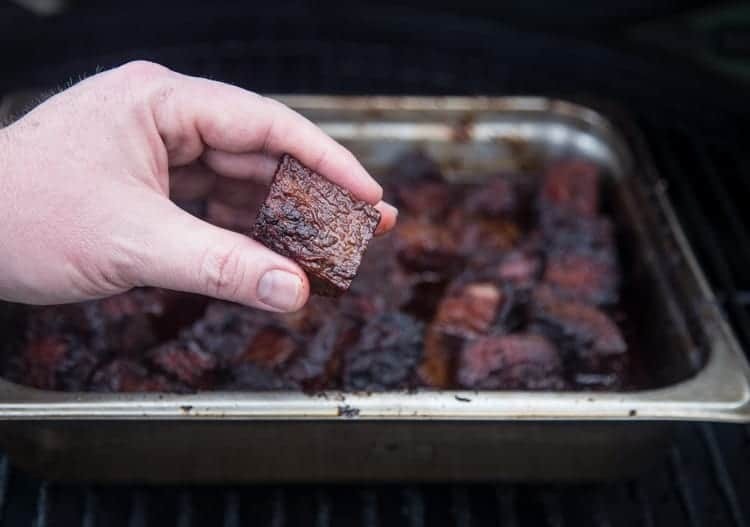 Typically we start with one cup of sauce and add more as needed to make sure the burnt ends are all evenly covered, otherwise the burnt ends will continue to cook unevenly and you’ll have some chewy bites alongside of some perfect morsels. For more flavor add a touch of butter, and honey. 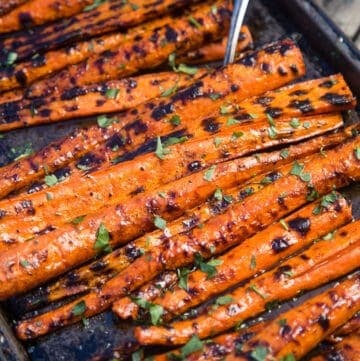 This adds another punch of flavor and the sugar in the honey help caramelize. Cook for two more hours. The fat will continue to render out of the burnt ends, and the sauce will reduce while cooking. After two hours, when the sauce has reduced a bit, cover the pan with foil and return to smoker. 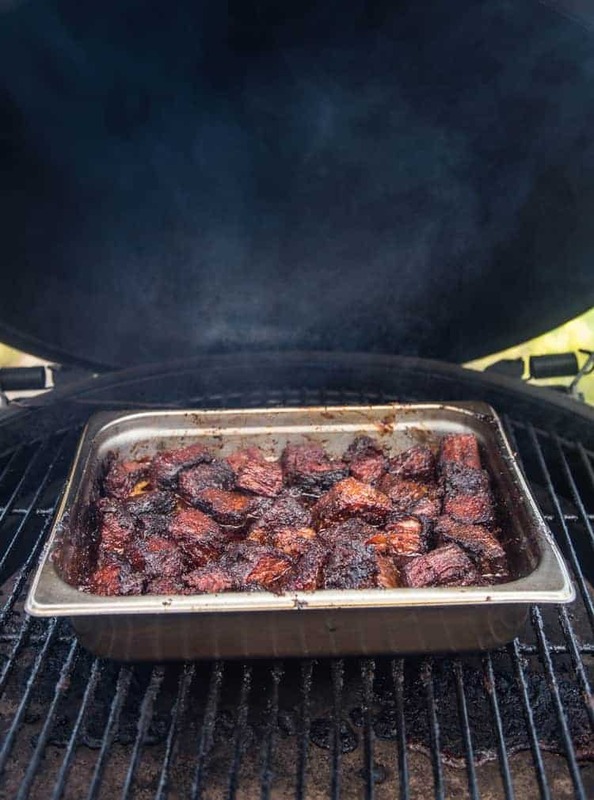 Continue cooking, covered, and check the temperature of the burnt ends 60 minutes later, and pull when the internal temperature of the burnt ends are 200 degrees, or until the meat thermometer inserts like into butter. This process can take up to 2 additional hours after they are covered in foil. The key is temperature not time. When you get the temperature reading and feeling you like, pull the ends and serve when they slightly cool. Don’t forget about the flat! Continue to smoke, wrapped in butcher paper (or foil), until the temperature of the flat starts reaching 190 degrees and after the brisket comes through the stall. When the temperature probe also inserts into the flat like butter, the flat is done. Remove wrapped, and place into a small cooler (with no ice) to let rest for an hour. Remove, slice, and serve for the main dish. 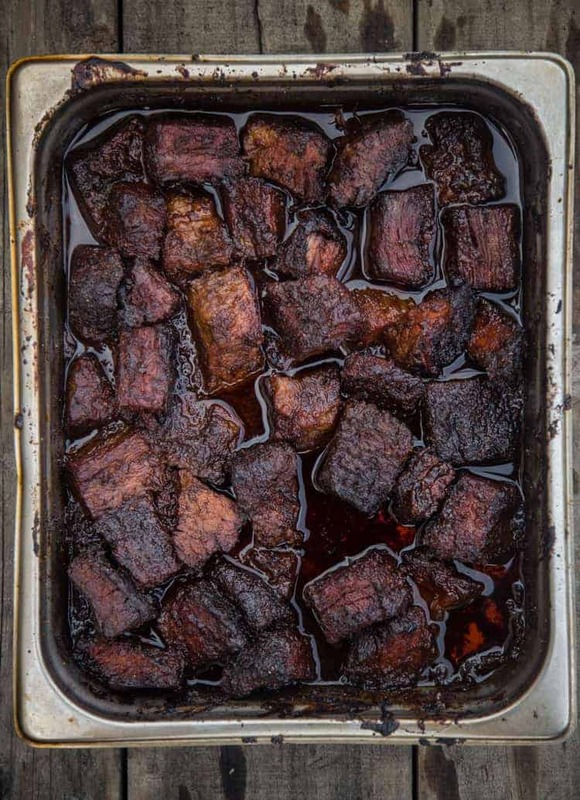 Recipe for the best tender and flavorful Beef Brisket Burnt Ends made with Americal Wagyu beef. The ultimate BBQ meat candy! The day prior to smoking brisket, trim. Using a sharp knife, remove excess layers of fat and silver skin. Coat the brisket with olive oil and then combine the dry rub ingredients in a bowl. Reserve 1/3 of a cup for the burnt ends. Liberally season the brisket with the dry rub. Don't be shy. 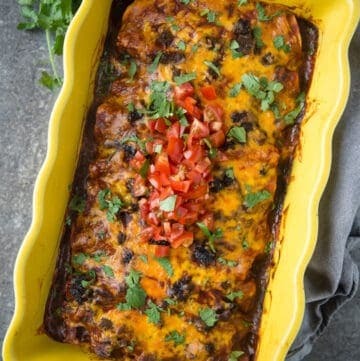 Wrap in foil and place in fridge until ready to cook. Preheat smoker to 250 degrees F using apple or cherry wood. Remove the brisket from the fridge at this point. 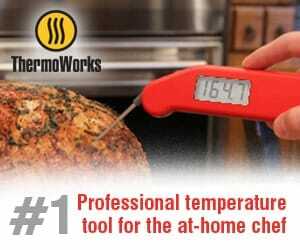 When smoker is at temp, insert your meat thermometer into the flat and place in smoker. We place ours fat cap side down, as the bottom of our smoker is hotter than the top. 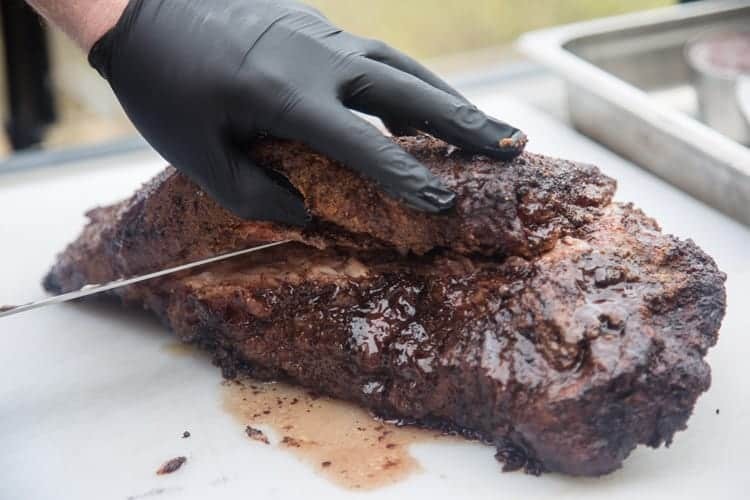 Smoke until the brisket reaches an internal temperature of 165 degrees F. Remove from smoker and then, using a sharp knife, remove the point from the flat. Trim some of the excess fat off point and the flat. Wrap the flat in peach butcher paper, and then re-insert the meat thermometer. Place back in smoker and continue to cook until the internal temperature of the brisket flat reaches 190 degrees. Begin temping the flat in various places, and remove from smoker when the temperature probe inserts easily into the flat like butter. This can take 3 to 5 additional hours depending on size of brisket. Place wrapped brisket flat in a cooler with no ice and let rest for an hour. Remove and then slice against the grain. After placing the flat into smoker, cut the point into 1 1/2-inch cubes. Place into a smoker safe tray. Season with the reserved 1/3 cup of dry rub, and then add barbecue sauce, butter and honey, and toss together. Place uncovered in the smoker and stir once the butter and honey have melted. Smoke in the tray uncovered for 2 hours. Stir midway to incorporate the sauce and move the cubes around. After 2 hours cover with foil and place back into the smoker. Remove when the internal temperature ranges from 190 to 205, or when the meat thermometer inserts into the cube like butter (expect an additional 1 or 2 hours). For the barbecue sauce we recommend our KC Style BBQ Sauce. You may be surprised to know our favorite go to for Burnt Ends is rosé. 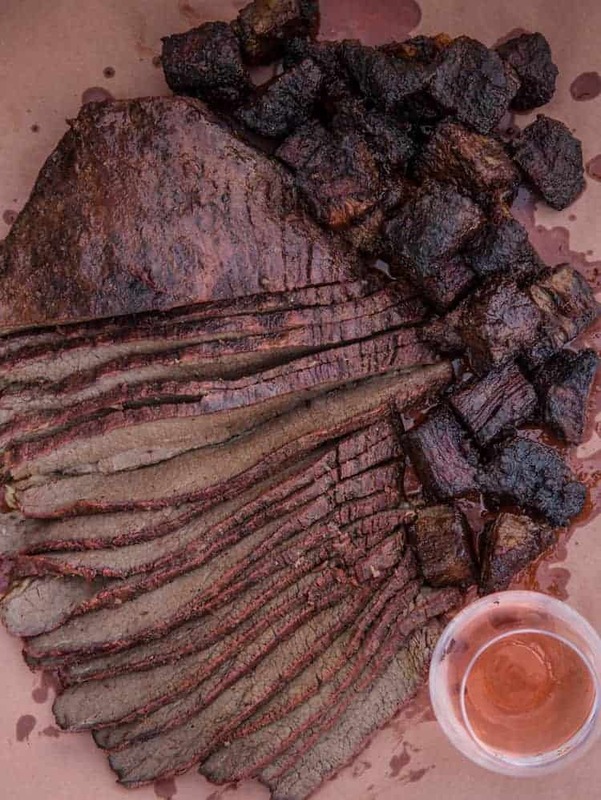 Because of the smoky beefy flavor, and adding honey, butter, and sauce, a nice dry rosé complements the flavor of the brisket. Look for bold Washington State rosé which tend to be made from merlot, or bigger red blends. 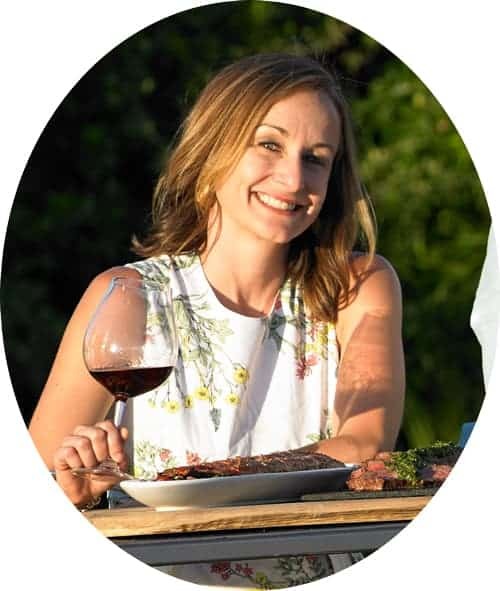 Whenever I connect with ranchers or companies representing their ranchers, I love to hear about their story. What goes into getting quality beef to our table. Mishima stands out with their attention to detail. Incredible curation of the ranchers, cattle bloodline, and the treatment of the animals. The way the product is packaged and shipped is key, it is shipped flash frozen, so you can store for a period of time, or thaw and cook almost immediately. I encourage you to to go here to learn more about their great story. We are also thrilled to offer a temporary Mishima Reserve coupon code! If you use the coupon code VINDULGE (not case sensitive) you will get 10% off Mishima Reserve beef site wide until May 15th! So this is a great opportunity to grab brisket, New York Strip, or any other cut you love cooking now and for the next 30 days! Whether for upcoming holidays or just a weekend practice. You will not be disappointed and you will see why Mishima Reserve beef meets the fundamental rule with all things grilling and barbecue. It all starts with great quality product. Thank you to Mishima for the opportunity to offer this great discount to our readers!